On April 20, 2016, thousands gathered in Yonge-Dundas Square in Toronto, to commemorate the annual pot-centred event, ‘420.’ But it wasn’t just a passion for weed that tokers had to celebrate on this day – breaking from Canada’s historic stance on marijuana policy, the Trudeau Liberal government officially announced its plans to legalize marijuana by July 1, 2018. While this new approach to marijuana policy and regulation has come as a breath of fresh air to some pro-legalization supporters, many medical professionals and scientists have publicly decried the Liberal government’s intentions to work toward legalization in Canada, as they firmly believe more research on the clinical benefits and risks of marijuana is required before thoughtful policy and framework can be launched. Adding his voice to the debate around marijuana legalization in Canada is Steven Laviolette, PhD, Anatomy and Cell Biology, a scientist who specializes in neurobiology research and has extensively studied the effects of marijuana usage on the teenage brain. He warns that the current environment of misinformation and lack of research poses a real threat to the adolescent population considering marijuana has the most significant impact on the developing brain. Through his research at Schulich Medicine & Dentistry, Laviolette is examining how different phytochemicals derived from marijuana are able to produce either clinically beneficial or negative effects. Much of this work has been centred on studying the neurodevelopmental exposure to the psychoactive component of marijuana, called Tetrahydrocannabinol (THC). 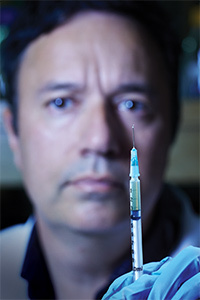 Using a model to simulate the adolescent brain, Laviolette and his team have discovered that if you expose the developing brain to THC, this exposure then has the potential to cause long-term problems in adulthood that resemble symptoms commonly observed in psychiatric disorders such as schizophrenia, depression and anxiety. Aiming to trace the molecular markers of THC that put adolescents at risk of developing these disorders and use the results to find out how, the team hopes these findings can be purposed as biomarkers and help to identify individuals who are at a greater risk of experiencing negative side effects if their brains are exposed to marijuana during specific periods of brain development. According to Laviolette, marijuana, however, does have redeeming qualities. He says his research on cannabinoid (CBD) oil, which is a non-psychoactive compound of the plant, has shown to counter the negative effects of THC and produce therapeutic results. “The amazing thing is that within a single plant you have two phytochemicals that are counterbalancing, and acting against each other in terms of their effect on mental health and the molecular and neural pathways they are producing in the brain,” said Laviolette. He believes that opposite pathways of molecular alternations in the brain may be responsible for producing these therapeutic and anti-schizophrenic effects. Though THC has shown to be harmful to the development of the adolescent brain, exposure during adulthood isn’t associated with the same list of potential complications and long-term outcomes. This is why many, including Laviolette, are urging the government to raise the minimum age of purchase of marijuana to 21, instead of the proposed legal age of 18. Being deemed an illegal substance, this classification has served as a hindrance to productive and open conversation around marijuana. In a time where scientists and medical professionals are increasingly having to defend their work and debunk the claims of ‘junk science,’ Laviolette says as a way of setting the facts straight, greater re-education and public outreach efforts are necessary to combat the extreme voices heard from both pro and con legalization camps. The proliferation of false claims, like the well touted ‘marijuana isn’t addictive’ myth, are indicative of just how dazed and confused the public really is about the drug and why many argue that the government is rushing legalization in Canada. “Marijuana absolutely has dependence-producing properties, which are associated with the strains that have the highest levels of THC,” said Laviolette. Not unlike other illegal street drugs, the potency of marijuana has steadily increased since the 1960s. With users now able to buy strains with around 20 to 30 per cent of THC, this is a drastic increase from the potency of marijuana in the 1960s which sat at just under 10 per cent. Observing the harm that high THC levels pose on the user, Laviolette is researching which ratios of CBD to THC are most effective and can modulate the risk factors associated with psychiatric disorders in an attempt to find middle ground on this issue. “Obviously we don’t want to have a product on the market that has the potential to be psychotropic, but yet, we are moving toward legalization without understanding all the risks associated with marijuana and that is a big concern,” said Laviolette. Highlighting a frustration felt within the scientific community, marijuana research in Canada has historically been expensive and difficult to conduct because of how tightly controlled the product is and the regulatory hurdles researchers must endure to gain access to it. This lack of research and insight into marijuana also reflects the Canadian Medical Association’s (CMA) aversion to recommending and promoting medical marijuana as a safe treatment option. A vocal opponent to legalization, the CMA believes there is insufficient scientific evidence available to support the use of marijuana for clinical purposes and that clinical risks and benefits, along with proper dosage guidelines, haven’t been explored well enough yet. Laviolette agrees that more marijuana research is needed, but says scientists and the Canadian government must work together to engage the CMA and devise a more cohesive message around marijuana that will garner greater understanding. Reflecting on how his research fits into this equation of creating awareness within the medical community, Laviolette says he would like to see his research move from ‘bench’ to ‘bedside’ through clinical trials and test which cannabinoid formulations and delivery methods work best on the patient population. Taking it one step further, Laviolette believes that given the nation’s historic use of marijuana as a therapeutic and the expansive cannabinoids biotechnology sector in place, Canada has the resources and potential to emerge as a leader in medical marijuana research.